Tyrphostin 9 is firstly designed as an EGFR inhibitor with IC50 of 460 μM, but is also found to be more potent to PDGFR with IC50 of 0.5 μM. Gazit A, et al. J Med Chem, 1989, 32(10), 2344-2352. Yura Y, et al. Arch Virol, 1995, 140(7), 1181-1194. Boucher P, et al. J Biol Chem, 2002, 277(18), 15507-15513. Liu M, et al. Am J Physiol, 1995, 269(2 Pt 1), L178-184. Stoilov P, et al. Proc Natl Acad Sci U S A, 2008, 105(32), 11218-11223. Levitzki A. Biochem Pharmacol. 1990, 40(5), 913-918. Afatinib (BIBW2992) Dimaleate irreversibly inhibits EGFR/HER2 including EGFR(wt), EGFR(L858R), EGFR(L858R/T790M) and HER2 with IC50 of 0.5 nM, 0.4 nM, 10 nM and 14 nM, respectively; 100-fold more active against Gefitinib-resistant L858R-T790M EGFR mutant. Poziotinib (HM781-36B) is an irreversible pan-HER inhibitor with IC50 of 3.2 nM, 5.3 nM and 23.5 nM for HER1, HER2, and HER4, respectively. Phase 2. 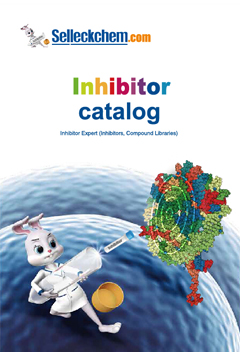 Afatinib (BIBW2992) inhibits EGFR/ErbB irreversibly in vitro with IC50 of 0.5, 0.4, 10, 14, 1 nM for EGFRwt, EGFR L858R , EGFR L858R/T790M ErbB2 (HER2) and ErbB4 (HER4), respectively. 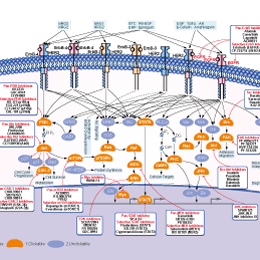 Osimertinib (AZD9291) is an oral, irreversible, and mutant-selective EGFR inhibitor with IC50 of 12.92, 11.44 and 493.8 nM for Exon 19 deletion EGFR, L858R/T790M EGFR, and WT EGFR in LoVo cells, respectively. Phase 3. Lapatinib, used in the form of Lapatinib Ditosylate, is a potent EGFR and ErbB2 inhibitor with IC50 of 10.8 and 9.2 nM in cell-free assays, respectively. AG-490 (Tyrphostin B42) is an inhibitor of EGFR with IC50 of 0.1 μM in cell-free assays, 135-fold more selective for EGFR versus ErbB2, also inhibits JAK2 with no activity to Lck, Lyn, Btk, Syk and Src. Rociletinib (CO-1686, AVL-301) is an irreversible, mutant-selective EGFR inhibitor with Ki of 21.5 nM and 303.3 nM for EGFRL858R/T790M and EGFRWT in cell-free assays, respectively. Phase 2.